Best business wordpress themes 2015 are used to create beautiful wordpress websites for business or corporate. These business themes are fully responsive. WordPress is the most popular CMS platform over all the world, So WordPress themes are very popular in the online market. The website is a strong online marketing tool that you can use for promoting your business online easily with WordPress. Building a creative corporate or professional website is made easy with the help of WordPress. Responsive business WordPress themes are easily available these days and these would be suitable for every business. Such business WordPress themes are specially well designed for managing and the business online in the best way. If at all you would want to create a great website that is appealing and outstanding, then the below mentioned business WordPress Themes can definitely suit your business in the best way. These premium business WordPress themes have its amazing features like good design, user friendly, flexible, slide show and much more. Here we collect best responsive business wordpress themes 2015 according to the demand of web designers, we found best premium business wordPress themes which are well designed. In this roundup collection, we have listed some of the 15 best responsive business wordpress themes 2015. These are modern, good looking and have useful functions that will help you promote your projects and services. Impleo is a WordPress theme packed with features. It’s the one and only theme you will ever have to buy. Company is a WordPress theme that helps you bring your business closer to your customers. It is aimed at websites that want to present themselves in best fashion possible while looking great on mobile devices. Featured images are available for each page and post and are automatically re-sized to fit user’s screen size. Our latest multi-purpose theme ‘Atulya’, which is built on WordPress platform, is designed as a WordPress theme capable of building any kind of websites. The theme is visually pleasing and has all the features needed for building websites for corporates, product landing pages and e-commerce websites. John is the ultimate WP template for presenting your services and products. Johns amazing home portfolio feature lets your website sparkle and stand out from the crowd. John is perfect for those looking for a visually oriented website including all the bells and wistles. Finanza is a clean responsive WordPress theme. It is especially designed for Business, Financial Advisor, Accountant, Law Firm, Wealth Advisor, Investment and general corporate website. Basis is a trendy, elegant WordPress theme built especially for construction, building, and refurbishment companies. Abda Client is a WordPress theme designed for multipurpose use. Abda Client makes design and building webpages easy with a drag & drop editor, Customize functionality to chose fonts and colors, and a shortcode generator to help make content more flexible. CoPro is a very professional yet super-easy to use theme. 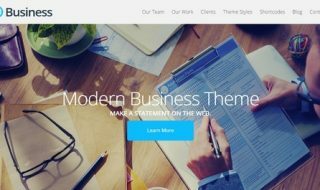 Finance Business Corporate WordPress Theme is created for business websites, like company online presence websites, finance, consulting, tax help, insurance and loans websites, etc. Exciter is a clean and professional site template, perfect for all types of companies and personal web sites. Advanced theme admin panel, drag-and-drop page builder, lots of options and configurations will help you to customize almost any part of your website as easy and comfortably as you could ever imagine. Essence Business is a premium Responsive WordPress theme with a multipurpose usage. WordPress 4.1 compatible. Dragon is a creative and corporate WordPress theme featuring material design. It’s responsive, so the layout will adapt to different screen sizes of mobile phones, tablets or desktop computers. Sarojais a creative, responsive WordPress theme possessing a Clean design. It’s perfectly suitable for all kinds of creative websites, corporate and business firms, photographers.